Turn right or go through. Regulation signs regulate traffic speed and movement, displaying rules which drivers must obey. 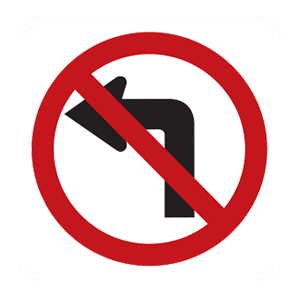 This regulation sign means that left turns are prohibited. Seat belts should still be worn. Seat belts do not need to be worn. Seat belts should be worn behind the back. Airbags are important safety devices that provide protection in crashes. For best protection, a vehicle's lap and shoulder belts should be used in combination with airbags. Locks the front wheels of a vehicle, causing a loss of steering. Keeps the brakes from freezing. Continuous hard braking on snow and ice can result in the locking of the front brake, causing a loss of steering. 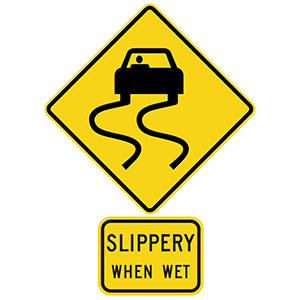 To avoid the need for excessive braking, make sure to maintain an appropriate speed for conditions. What is the maximum speed limit in outlaying parts of cities and villages with no posted speed limit? Unless otherwise posted, the maximum speed limit in outlying parts of cities and villages, as well as in semi-urban districts outside of cities and villages, is 35 miles per hour. When the cross traffic has cleared. Unless a posted sign prohibits it, you may turn right at a red light after coming to a complete stop. When turning on red, you must yield to other traffic, pedestrians, and bicyclists before proceeding.